One thing I will say for Miles. He never left Grandma’s bedside the whole time. He sat there for hours on end, as vigilant as one of the Queen’s guards, shifting his gaze from the monitor to her labored breathing, looking away once in a while only to kiss her cheek, plug in his phone or change the album on his headphones. The ability to be lovingly and intimately connected in the face of the enormous impending change, and still remain centered enough to listen to one’s own inner music. 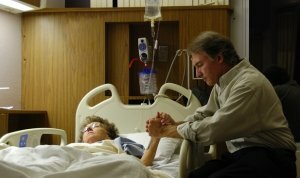 The image is so pertinent as my husband and I sit lovingly at his mother’s bedside, waiting for what we know is to come. Everything I’ve been through, keep my composure, maintain respectful civility, but always mindful of real challenges facing me ahead. Yes, I’ve kept it together.